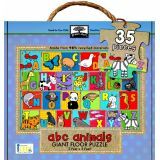 Have fun learning about letters and animals with a giant 26-piece floor puzzle. Realistic animal images--except for the magical unicorn! See animals in their natural setting. Durable, sturdy puzzle pieces. 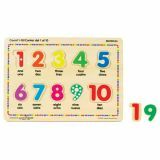 Assembled puzzle measures 19"H x 27"W.
Learn numbers 1-10 in both English and Spanish while using this bright wooden puzzle with large pieces. Matching image underneath puzzle piece. Great Value - 2 GeoPuzzles in one box! Contains USA and World GeoPuzzles in separate, re-sealable bags. Pieces shaped like states and countries. Who says puzzles have to come in hard, square boxes? 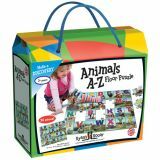 Puzzle Pouch - USA & Canada is a fun, educational jigsaw puzzle in a soft portable pouch for on-the-go fun. 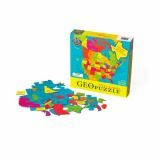 The Puzzle Pouch is based on Geotoys' bestselling USA/Canada GeoPuzzle. 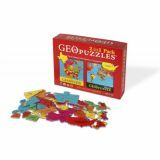 Each 36 piece puzzle includes a print-out to help young geographers put the puzzles together, at home or on the road! A beautiful garden of flowers contains eight circles of the same size and shape for mix-and-match play. Each piece is a different color with a matching color well. Reinforces basic grasping and tactile stimulation, one-to-one matching and visual perception. 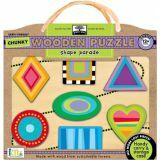 A bright and bold shape parade contains seven basic shape pieces with fun patterned designs. Pieces are self-correcting and can fit only into one spot. Names of shapes are printed under each piece. 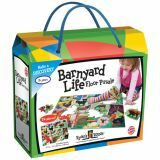 Reinforces shape, color, and size recognition as well as orientation and directionality. 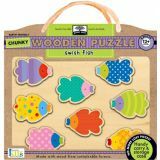 A bright and busy scene of colorful fish contains eight fun pieces that are all the same size and shape, but some are facing left and some are facing right. Reinforces directionality (right/left), orientation and rotation, patterning and color matching. 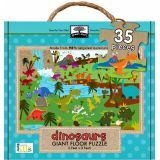 Kids will love assembling this giant floor puzzle to discover a different wild animal for each letter of the alphabet. 35 oversized chunky pieces in a durable carrying case. 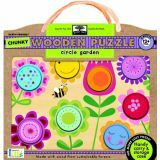 This puzzle is printed on 98% post-consumer recycled materials and printed with eco-friendly ink. Completed puzzle measure 2'x3'.